We are back in home! Travel from coast to coast was no small feat for our family of three, we had our share of moments. (Given that we just spent time in the woods with two lovely families, one with four kids and the other with six, it seems pitiful to even comment on our trials with one kid, but I suppose for each the challenge according to their number of offspring.) Upon leaving squam, we agreed: we actually had a vacation. The last time that we agreed on that point was in 2009 before we were married. Our primary mission was accomplished and with that I traveled home a bit lighter. But returning to life, with all its in-progress-challenges, well that’s a series of other stories to unfold over an unknown length of time. As I anticipated, all sorts of thoughts inhabited my mind while we were away. Given our absurd amount of stuff (we could barely carry it all – there really were some airport scenes that were movie-comedy-worthy), we left my laptop at home. This proved to be something of a disappointment for both us adults at some point during our journey, but that’s the fun of an adventure, having to make do with the unfamiliar. The upshot is that I have A LOT to share this week, and maybe next depending on how re-entry goes. I really did try to follow my own instinct and Elizabeth’s advice with regard to arriving at squam with a clean slate of expectations. But I was (too) eager to share. I’ve got two years of ideas under my belt and some of them just seem too good to keep to myself. I would not be true to myself if I did not say that I experienced some disappointment with respect to my expectations. Damn expectations, they are pretty much designed to be that way aren’t they?! But at every turn, squam provided me with the salve that only a friendly face and an open ear can provide. Ultimately, I know that I will find my way, I just don’t have it mapped out. Here’s the essay that I wrote to organize my thoughts for the Pilates talk that I set out to give on Saturday morning, I’d always planned on posting it here since I figured that I’d probably go off on tangents and it can be equally useful to read ideas as it can be to hear them spoken. I dedicated this talk to Romana Kryzanowska since it occurred within twenty-four hours of her memorial service in New York city – so close, yet still so far from where I was on the globe. Have you ever witnessed the surprising strength of a person under the age of three? Now that I have spent every day of the past two plus years with such a person I have a deeper understanding of that strength. I’m come to see that very small people can be very strong when they align their will with the physical force of their bodies. In my work as a Pilates instructor I see adults who perform in sharp contrast to that perfect and holistic alignment. In those simple terms, it is easy to see how much we each stand to benefit from practicing Pilates. 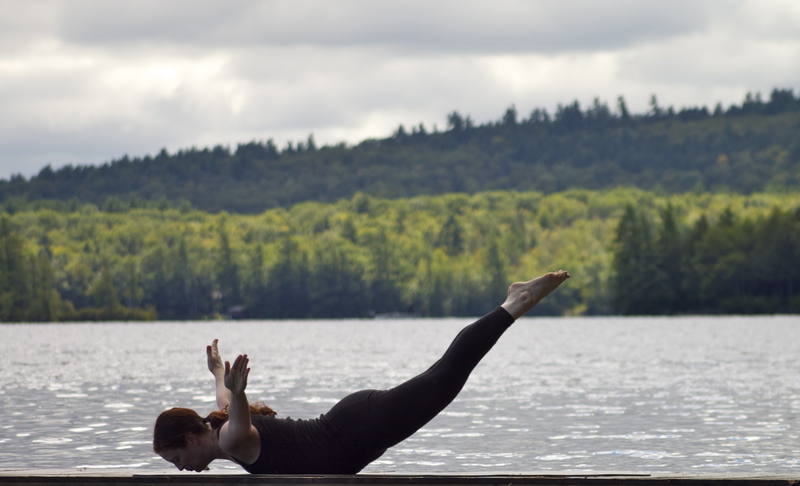 At it’s most fundamental level, Pilates is designed to bring us back into alignment. Physical alignment. Mental alignment. Spiritual alignment. That all adds up to and alignment of our entire selves. I have come to think of Pilates training in two categories, there are the moves themselves which are very thoroughly researched and well designed, by Joseph Pilates the originator of the method. The idea is to move the body with a constant balance of stretch and strength. In each move, the entire body is called to participate. In the system of Pilates, we perform movements varied on a few themes in all manner of relationship to force, support, and gravity. Through the varied practice of the basic concepts, we quickly learn a new and improved way of moving, thinking, and being. Secondly, there are the concepts underlying the moves. This is the control piece of the Pilates definition. It is also the mental piece. The spiritual piece is perhaps a bit more elusive in definition. It comes as a direct consequence of the physical and mental practices and their unification. I think that it’s safe to say that the spiritual aspect of Pilates is what keeps people coming back. Aside from feeling good on the physical level and stimulating and interesting on the mental level, Pilates tends to leave us feeling uplifted and inspired. Once the various pieces of ourselves begin to come back into alignment, we often experience a new sense of confidence and enthusiasm for what is possible. At this point we are well on our way to reclaiming that pure unification of will and physical strength that so typifies the very young. Now, for a moment, imagine having a clear sense of your desires and a confidence that they will come to fruition. That right there is what so many of us are looking for in this complicated contemporary life of ours. I came to Pilates in a rather indirect way. I completed a locally based certification program that was very removed from the way that Joe Pilates taught the work. Sadly, this is more common than not at this point in the history of Pilates. For reasons of which I am not aware, Pilates has been consistently pirated for the past four decades. By pirated I mean that people have broken away from their teachers and begun putting their own spin on the work. Because of the infinite variations that exist in our experiences, this can very quickly give way to many disparate things being called by the same name. Now to be fair, keeping true to the original is a nearly impossible task and what’s more, it’s not that the innovations of all these people leads to bad stuff, it’s just not really Pilates as Joe Pilates designed it to be. Now that I have had the benefit of being trained by the very person who Joe Pilates put in charge of keeping his method alive, and now that I have had the benefit of learning from many others who have worked closely with her and who feel a very strong degree of motivation to keep the work alive, I have come to realize that staying true to the original while honoring our experiences in present time is a daily challenge. Not surprisingly, it is a job that requires the unification of will and physical strength. In order to do the work, we must keep our minds alert, and our bodies sensing. We must come to understand the physical sensations of properly executing a Pilates workout, we must understand what creates those sensations, and we must share that knowledge. While it is important to find a teacher who will guide you correctly into the Pilates method, it is equally important to train yourself to be a good learner. Pilates moves are great, but they are only a small piece of the work. The concepts are the real heart of the method, and while a teacher can talk till they are blue in the face, only the learner can actually embody the concepts of Pilates. To my mind, that makes Pilates special. I see Pilates as part of a transition in our human consciousness. If we look back to the the period around the turn of the 20th century, with a particular attention on what was happening in physical practices, we find three luminaries: Frederick Matthias Alexander, Joseph Pilates, and Moshe Feldenkrais. I like to think of those three as pioneers of a new movement in western culture. I have a sense of what I call collective consciousness, I am not particularly thorough in my understanding of the term, rather I’ve sort of developed my own definition. Basically, I think of those three, but I know that there must have been many others who were beginning to understand all sorts of interesting and beneficial things about our bodies and how they work. They each managed to create a system based on their discoveries in their lifetimes and to share their systems with enough people so that today we can learn and benefit from what they figured out on their own. Surrounding these individuals, there were most assuredly others who were working on similar types of discoveries and methods and as time passed and we entered the twentieth century more and more people made discoveries and created methodologies of sharing those discoveries and their benefits with others. Fast forward to the present day and we each have many more ways to learn about our bodies and to support optimal functioning than our counterparts of the late 1800s. We are indeed living in a time of discovery and development, and the terrain is our own bodies. For my part, I find this all very exciting and I am passionate about infusing others with my excitement and helping them to live more fully in their bodies. I am here at this gathering because aside from loving my work with the body. I also love to cook healthy food from scratch, and make things. I am the sort of person who used to fantasize about making all my own plates. I’ve had my own business since I just before my 28th birthday. Up until then I’d been working in some capacity as a teacher while always studying movement since I graduated from college. In short, my interests in the human body left me precious little time for craft and cooking and kept me in the city where teachers were abundant. I’m in a way pulled in two directions by these two loves. The desire to create my world through craft and the desire to create my life through mastery of my body. That is not to mention the necessity of earning money. In my twenties, it became clear that I could earn a decent living as a Pilates instructor and when I became a business owner I had the opportunity to channel a good deal of my creative impulses into the work of building an enterprise. Overall, it is fulfilling work for me and I continue to be driven by passion. When I tapped into the world of taproot, I felt a sense of belonging there. But by the time I’d arrived, I’ve established myself in my own work and because of that, I came as a creator in the broader sense of the word. My daily work is in tending to my body, tending to my son, and tending to the bodies of my clients. I still craft and cook, but the most of my creative impulses go into my Pilates practice, personal and professional. This has led me to an interpretation of what folks like me are doing in the arena of our bodies. We are helping us all to live more fully in our bodies and in doing so we are making our unique contributions to our collective advancement. Because of who I am and because of my two loves, I see a relationship between the two. I see that making something that we will use and cherish with our own two hands gives us a sense of empowerment and presence in this world of ours. I see that understanding our bodies and having control to move with grace and power has a similar effect. I see how both are rooted in being ourselves. I see how both give us a sense of influence on the world around us. We all see the world through the lens of our passion and in so doing are able to draw connections between what may seem to others to be disparate things. When I first entered the blogosphere I was amazed at how many blogs there were about food. After some reflection, I arrived at my first conclusion about why this is so (I’ve since deepened my understanding), we each eat every day. Food is one of our basic commonalities. If I follow that line of logic, then our bodies are clearly another shared experience. But at this point in history, our bodies are still easily objectified or ignored. We have a harder time embracing talk or thought about our bodies than we do about projects that we do with them. I think that this indicates room for improvement and healing. I think that this indicates that these days, our bodies are one of the frontiers of our collective advancement. The groundwork has been laid by generations of study and development. Now it is just a matter of each of us delving into the work at hand. Given my experience in this arena, I am comfortable in making a guarantee that only benefits await us on the journey deeper into ourselves. Pilates has become rather elitist and sometimes I’ve struggled to reconcile my inner hippie with my chosen profession. It seems to me that this was important in that it needed to be carefully passed from person to person. This is a costly enterprise. But now with the internet and increasing advances in technology, it is more possible to share the work with a broader audience. This is an exciting time in the development of the Pilates method. I am eager to share the work. Now that I am a mom and I understand what a day in the life of a mom is like, I am that much more inspired to offer Pilates in a way that is accessible to people who cannot get to a studio but who have an interest in learning the work and reaping the benefits. For my part, I am not as available to be in studio since being with my son is my top priority. Building a teaching practice in which I can do what I love and share what I know on a timetable that works for our family is also part of how my interest in the internet developed. It is worth mentioning that Pilates was originally taught in a different way than we commonly see it taught today. When you came to Joe and Clara’s studio, you were told that you had to come three times a week. You were given lessons, but you were expected to memorize your routine from day one, and very soon, you were only supervised in your workout. Your teacher did not stay only with you for your entire workout. You were expected to practice the mat exercises at home. I learned this information from Jay Grimes, who is one of the teachers that we still have with us who both learned from Joe and Clara Pilates directly and who continued to study with Romana after their passing. The question that I mulled over for a few years before I went ahead and changed my teaching practice to more closely reflect what Joe and Clara did was why can’t the people of today be empowered in the work in the same way as they could back then. The answer is, of course, that we can. And now that I’ve begun to teach in this way I see it with my own eyes. I have become a much better teacher because the focus in my studio is on the learner not the teacher (thanks to Amanda I was reading John Holt’s books as I was devising my new teaching format and that helped a lot with the philosophical basis for what I’m doing). And the clients are much better learners because they are empowered as such. And the Pilates itself? Well, of course it’s better. It’s coming from within just as it should. I have my ideas and I sincerely hope to see them come to fruition. How that will happen, I don’t exactly know yet. But I do know this: Pilates has played a major role in who I am today. It has given me the confidence to first acknowledge my dreams and then to follow through with action to make them reality. Along with that, it has given me a way of understanding us and a sense that I can make a positive contribution to our community. With that I do not have to worry about the how, because I know that I come from a solid foundation. I cannot think of a better way to begin any worthwhile venture. This entry was posted in Pilates FKA Contrology, the Art of Control on September 17, 2013 by elizatwist.